Affordable Housing has been the talk-of-the-country for a while now, with the governments looking to bridge the gap between supply and demand for affordable housing in the country. Despite high urban land prices, affordable housing is expected to lead the growth of the real estate sector in the country. Further, the country’s total urban housing shortage is projected to be about 30 million by 2022. Affordable housing, earlier was not included in the “Infrastructure” category due to which the private sector was hesitant to participate. The affordable housing segment has been able to gain momentum because of the Central Government policies such as Pradhan Mantri Awas Yojna (PMAY) and the vision of “Housing for All by 2022”. 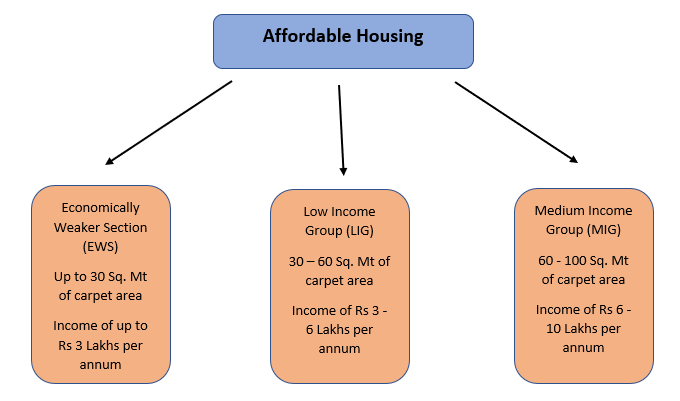 As of now, affordable housing in India is more of a local game and most of the supply in this category is fragmented and driven by local developers. With the government keen on addressing key concerns such as profitability as well as ticket sizes of affordable housing units, national/regional developers are now keenly evaluating the segment. This is especially relevant in times where affordable housing can serve as a revenue stream in the wake of slower sales in other categories, especially luxury housing. External Commercial Borrowing (ECB) has been allowed for affordable housing projects from 2012 to enable lower interest cost for developers and ensured better capital availability for developers of low-cost housing. The Credit Risk Guarantee Fund with a corpus of Rs 1200 Cr in collaboration with NHB was set up (2012) to facilitate credit availability to low income customers without any collateral. The purpose is to guarantee the lending agencies for loan to LIG/EWS borrowers for loan amount up to INR 8 lakhs and unit size not exceeding 430 sq. ft. Urban Housing Fund Refinancing Scheme with a corpus of Rs 2000 crores in the year 2013-14 has been created. The purpose of this scheme is to provide refinance assistance in respect of loans extended by HFCs to public agencies, private agencies, developers, builders for their Affordable Housing projects. The arrangement is applicable for slum improvement/ rehabilitation as well as for Affordable Housing projects where unit costs do not exceed INR 30 lakhs. The government has already provided an interest subsidy of 4% to 6.5% under the PMAY for home loan customers under the Economically Weaker Section (EWS), Lower Income Group (LIG), and Middle-Income Group (MIG) categories. A subsidy of 4-6.5% pushes the effective home loan rates below 5%. The Central Board of Direct Taxes (CBDT) has extended the benefits of section 35AD (permitting 150% of capital expenditure as tax deduction) of the Income Tax Act, 1961 with effect from assessment year 2012-13 to affordable housing. However, practically, there were no takers of this scheme as developers / builders have minimal costs capitalized in their books as capital costs. Major chunk of costs is represented by housing units as inventory / stock in trade not as capital asset in order to be eligible to claim the benefit of investment linked incentive. ü Project approved by competent authority after 1 June 2016 but on or before 31 March 2019.
ü Project is completed within 5 years from date of approval and certificate of completion of project as a whole to be obtained from competent authority. ü Build up area of commercial establishments not to exceed 3% of the aggregate built-up area. ü Plot of land measuring not less than 1,000 sq. mts. in case of metro cities / within 25 kms from metro cities and not less than 2,000 sq. mts. in case of other cities. ü Size of the residential unit is not more than 30 sq. mts. in case of metro cities / within 25kms from metro cities and 60 sq. mts for other cities. Under section 80EE of the Income-Tax Act, homebuyers are able to claim an additional Rs 50,000 in tax deduction during a financial year as long as some conditions are fulfilled. In fact, this deduction of Rs 50,000 interest payment on home loan was extended to home loans sanctioned during FY2016-17 up to Rs 35 lakh for properties worth up to Rs 50 lakh until you repay the home loan completely. The continuity in this deduction will encourage home buyers and boost demand in affordable housing segment. As the sector receives a determined push from the government, it is likely to emerge as the new focus area for housing finance companies.Affordable Housing could be a game changer for the economy. It would support steel, cement, consumer durable, industries and create huge demand for jobs. As per CRISIL, the assets under management of affordable housing finance companies are expected to grow at a CAGR of 40% over the next four years, as compared to 17-18% for the housing finance sector, as a whole. The value addition for the government would be the fulfillment of it’s core objectives like “Housing for All by 2022”. Backed by a team of ex-Bankers and industry professionals, Alamak has capability and reach to get funding for RERA approved projects. Alamak may also get project cleared for funding to buyers and help raise private equity such projects.